We consider it an honor to have this opportunity to serve you with your memorial needs. The purchase of your family memorial is as important to us as it is to you. Your satisfaction is our most valued asset. We further guarantee to replace, free of all expenses to the original purchaser, or to the purchaser’s heirs, any part or parts of the memorial that may develop any imperfection within five years of purchase. Whitney Monuments will not be responsible for damage or staining resulting from neglect or gross negligence, vandalism, acts of war, unusual environmental or atmospheric conditions or natural disasters. 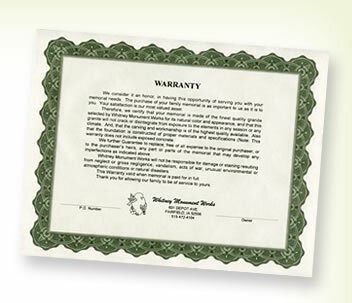 This warranty becomes valid when memorial is paid for in full. Thank you for allowing our family to be of service to yours.